Last Friday, Members of the Paektu Protection Squad made an unannounced visit to the offices of Daily NK and Unification Media Group (UMG). They wore dark coats, sunglasses, and came with pickets and paper flyers. 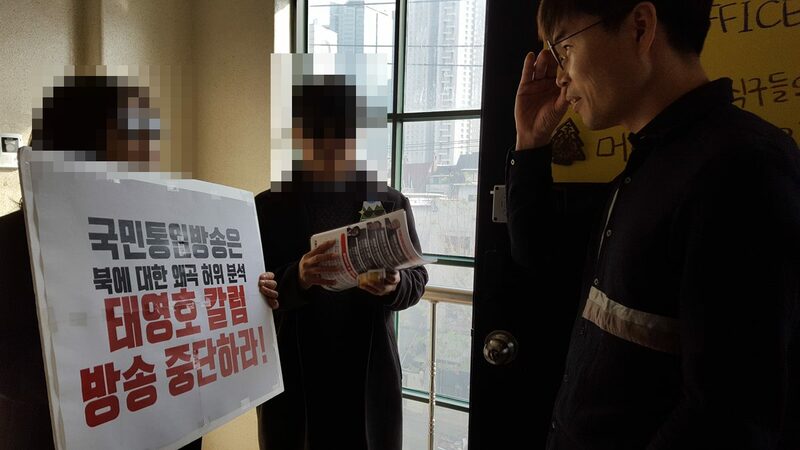 After hearing further reasons as to why the group wanted to stop the publication of Thae’s column, UMG and Daily NK journalists proposed that the two sides engage in conversation to better explain why UMG and Daily NK publish Thae’s columns and videos. UMG and Daily NK do not see Thae Yong Ho’s material as opposed to peace on the Korean Peninsula; rather, it clearly advocates for unification of the two Koreas under peaceful and justified circumstances. Thae, who until recently was a North Korean diplomat based in the United Kingdom, uses his own experiences to shed further light on North Korea’s foreign policy and suggests ways to achieve lasting peace on the Korean Peninsula. After the 7th Congress of the Workers’ Party of Korea in 2016 when North Korea made it a foreign policy goal to “acquire nuclear weapons but also remove international sanctions on the country,” Thae suggested that North Korea was following a strategy similar to that of Pakistan in seeking to maintain its nuclear arsenal. He has long proposed that multilateral diplomatic efforts are required to address North Korea’s weapons of mass destruction, which pose a barrier to achieving real peace on the Korean peninsula. Thae has worked hard to present a strategy aimed at achieving peace based on nuclear disarmament, as opposed to just short-term periods of peace that permit a further build-up of North Korea’s nuclear arsenal. Thae has emphasized a need to achieve real peace that allows freedom of movement, communication and affiliation by residents of both Koreas. 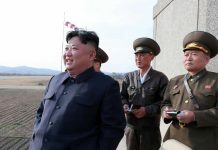 He has argued for a peace that does not see a continuation of oppression by the regime, and argues that North Koreans have a right to freedom and economic prosperity. Thae should not be viewed as an obstacle to peace on the Korean peninsula. He has the right to voice his opposition to politician-led events aimed at achieving an aura of peace; in other words, peace that ultimately gives in to North Korea’s desire to keep its nuclear weapons. Daily NK and UMG believes that all South Koreans, including members of the Paektu Protection Squad, should be free to welcome North Korean leader Kim Jong Un to Seoul in the hope of achieving peace on the Korean peninsula. 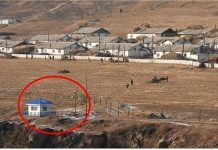 However, it is also important to be mindful of the estimated 100,000 political prisoners incarcerated north of the 38th parallel in camps that resemble gulags, with the remaining 24 million North Koreans living under an authoritarian dictatorship in one of the most oppressive nations on earth. North Korea’s pursuit of nuclear weapons, moreover, continues to pose a grave threat to the sanctity of human life, as well as peace in the region and the world. The Paektu Protection Squad states that it fights for human rights and democracy, while at the same time calling for the arrest of Thae Yong Ho, who has committed no crime. At great expense to himself and his family, he has simply taken a stand for democracy, human rights and genuine peace for all on the Korean peninsula. It should also be remembered that many of the journalists at UMG and Daily NK have themselves been the victims of brutal oppression in North Korea. They wish only to advocate for the welfare of their fellow countrymen back home. As such, Daily NK and UMG cannot acquiesce to the Paekdu Protection Squad’s demand to stop publishing Thae’s columns.